Accidents happen. Though there are plenty of ways to prevent incidents such as building fires, sometimes it is out of our hands. Fires in any building, commercial or residential, can be devastating in more ways than one. Fires can be destructive and burn all of your belongings and most prized possessions. Fires are expensive as well. Paying for damages can rack up quite a bit of money and if you’re unprepared the cost of damages could leave you in debt. On average, homeowners pay about $12,872 for fire damages ranging from water cleanup to making a claim to their insurance company after an incident. Because fire can be such an expensive accident, it is important that you do all that you can to protect your home and business. Installing fire alarms, fire suppression systems, and making payment on strong insurance policies, will help protect your business from severe fire damage. Any action to further support and protect your business or home, will significantly help you if an accident does happen. In order to put out a fire, you will need water to put it out. When a fire happens, much of the damages you pay are to clean up the water out of your building. Most property owners will pay between $1,000 to $3,900 just to clean up the water needed to put out the initial fire. Water is extremely important to clean up thoroughly, as any water damages could result in a mold breakout which can cost even more money to clean up. If a building catches on fire, soot will be a likely left behind. Soot is when organic objects are incompletely burned. If soot is left uncleaned, it could spell trouble later on. 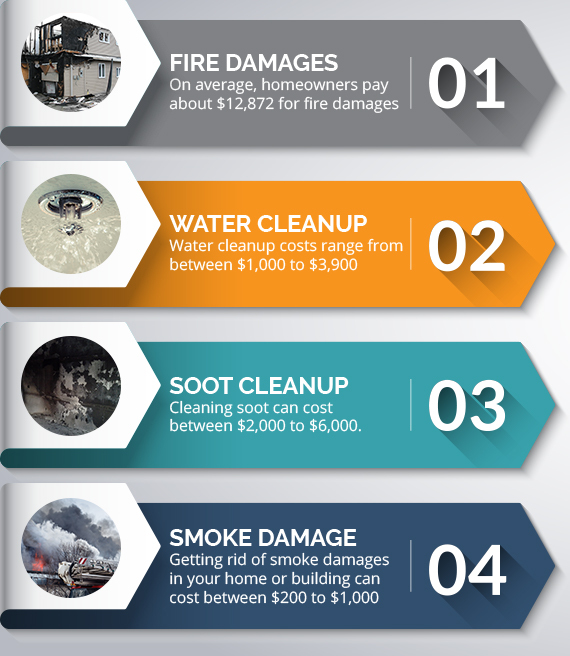 Cleaning soot can be extremely expensive, as it can cost between $2,000 to $6,000 to get rid of. Part of the inconvenience of cleaning soot is that it can be destructive if not cleaned properly, and requires special procedures to clean depending on the material that was burned. For instance, there are two types of materials that can burn: dry and oily. The different materials require different cleaning methods which could add up quickly. Soot can be dangerous if not addressed because it can cause more damage after the fire. If soot isn’t cleaned is can spread to other areas. If you have a fire, you will also have to clean your air ducts and air conditioning filters. Restoring smoke damage can be a challenge because you will need to detect which areas were affected. This will mean that you will have to find the burned or smoke affected areas and clean them accordingly. If your property is a victim of a fire, you will need to get rid of the smoke smell in your house or building. Part of the issue with smoke is that it is an odor that doesn’t go away with a little Febreeze. Cleaning out smoke can be a huge challenge and cost between $200 to $1,000. Fire preparedness can include any device from a smoke detector to a fire sprinkler system. When it comes to fire safety, you can never be too careful. After all, the faster you know about a fire, the better you will be able to handle the situation. Smoke detectors are a great safety tool because they will alert you the second smoke or a rise in temperature is sensed in your house. Once you are alerted that there is a fire, you will be able to get yourself to safety and call the authorities. Devices, such a fire suppression systems are also a useful tool to protect your home against a fire. Once alerted to a severe rise in temperature, the sprinkler systems will be set off in the triggered area. The water will help suffocate the fire and keep it from spreading to other areas of your property. In this way, sprinkler systems actually limit the amount of fire damage your home could suffer. It has been found that sprinkler systems reduce total fire damages to a home by 90 percent. 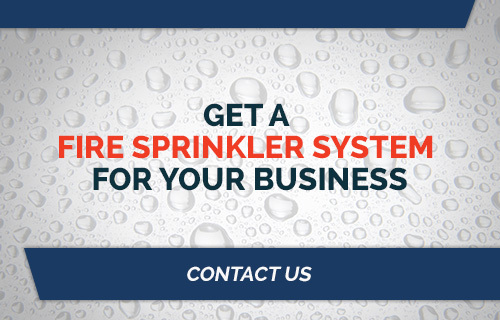 And, with a cost of only $1.50 per square foot of sprinkler coverage, these systems are inexpensive and extremely useful. Once the fire is put out, you will need to contact your insurance agent. They will be able to tell you how much your fire insurance policy will be able to cover, specifically related to damages. In America, most homeowners and business owners will opt for standard insurance policies. Every insurance agency varies in terms of what is deemed covered in the standard fire hazard package. While on the phone with your agent, they will likely tell you what is covered and the steps you must take to repair the damages. Some insurance agencies will demand that you have all damages repaired by a professional service, in order to track how much each of the cleanup requirements will cost. You will also have to factor in living costs while your home is being cleaned, as you won’t be able to stay or conduct business in the building that is currently getting repaired. After you have filed an insurance claim, it is important that you consult with professional cleanup services in your area. While speaking with them, you will need to confirm dates and times and keep them under contract to make sure the repairs are completed on time. As stated, fire suppression systems can significantly help you during a fire. Contact MLN Fire today for us to install a new system in your home or business.